2019 has so far been the exact opposite of how last year ended. The stock markets have been on fire with barely one red week so far. Yet yesterday, we get one red day and the median is calling a top, saying Monday was a pullback. This is clearly part of the normal price action. After a fall into the December lows, stocks rebounded hard and Salesforce (NYSE:CRM) stock led the rally for cloud stocks. In fact it set its lows in November, almost one month ahead of the rest of the market. So to find sellers at these pivot levels is normal. These are prior ledges from which CRM fell hard last October. Last night, management reported earnings and the stock fell on the headline. It’s not like they delivered a stinker. They beat the expectations but they failed to wow Wall Street with their forward guidance. Depending on who you ask, they guided lower than expected for the quarter and in-line for the full year. But the CEO confidence on CNBC last night more than made up the difference. It’s hard to short his efforts so it’s not surprising to see that the stock has recovered from the overnight dip. So is this a knife that I can catch? Yes, but it depends on the investor time frame. For the long term, I want to be long the stock but don’t take my word for it. Almost all experts on Wall Street rate the stock as a BUY or Strong BUY and price is still below their average price targets. The problem is that this is a momentum stock, so it moves fast in both directions. So on the way up it makes it hard to chase. Conversely, on red days it would take a lot of courage to go long because it seems falling into the abyss. Case in point on Monday Saleforece stock fell 6.7% ahead of its earnings and continued lower after hours. Those who want to trade CRM stock for the long term should not worry about a few point drops here. That thesis remains intact. The migration to the cloud is still in its infancy, and CRM is still taking share from the total market and perhaps muscling the smaller players out. This is the company that stated it all years ago. Clearly software-as-a-service (SAS) is the way to go and CRM is the original player in the field. It even went up against the giants like Microsoft (NASDAQ:MSFT) and beat them at their own game. However this is not a cheap stock. It sells at a 166X trailing price to earnings ratio but this is not too unusual given its growth rate. Wall Street allows for high valuations to stocks like CRM, Netflix (NASDAQ:NFLX) and Amazon (NASDAQ:AMZN) for as long as they continue to grow aggressively. Short term, the price action in the CRM stock is classic and this dip here doesn’t change the trajectory of the stock. In early February, it broke out through its $153 per share neckline and rallied 8% to the highs before earnings. This reaction merely brings the price back to that neckline. Yes, this could be considered as a failed rally, or since nothing has changed fundamentally then there is the better chance that it’s the bulls looking for more solid footing for their next leg higher. So, for long-term investors, it won’t matter exactly where they buy it. If the horizon is long then there is no need to be surgical in the entry point. But momentum shorter term buyers could go long CRM now to trade the bounce on earnings dips. Or do the pure momentum trade and not chase it until it sets a new high. The idea is to buy strength high and sell it higher. On the short side, I’d set a short-term stop out level at $152.50 or lower. Overnight the knee jerk reaction did breach it, so I’d probably wait for a closing price there before closing longs or initiating shorts. From the volume profile and since the move on the way up was so fast there is support but not until $148.75. Having said that, I have to consider the pin-action when trading CRM stock. If the market is higher from here then so will it be. 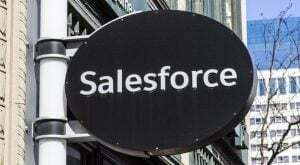 I find it unlikely that Salesforce falls alone. I’d wait out the big red candle if too scared but definitely pounce long CRM if the markets in general rally this week. Article printed from InvestorPlace Media, https://investorplace.com/2019/03/selling-out-of-salesforce-stock-on-earnings-is-wrong/.